Go 8 Bit does not disappoint with a great variety of games alongside some brilliant comedy. Go 8 Bit has returned to our screens with even more gloriously pixelated video games for us to marvel at. For those who haven’t seen it, the premise of the show is simple. It’s a comedy panel show hosted by Dara O’ Briain in which comedians Steve McNeil and Sam Pamphilon go head to head in variety of video games. These range from classic arcade games to the latest console releases. Ellie Gibson oversees the whole thing as the resident gaming expert, providing a bit of each game’s history. Both men are accompanied by a different comedian to help them beat the other team. The guests even get to choose a game to challenge the opposition with. The first episode of Series 2 sees Sara Pascoe and Richard Osman joining McNeil and Pamphilon’s teams, respectively. The show consists of five rounds: a classic game to start, the favourite game of each guest, a modern game and then a fresh take on a classic. This time the games consisted of Galaga, Doodle Jump (Pascoe’s choice), Micro Machines (Osman’s choice) and Human: Fall Flat. The final round was Block Block, a life-size version of Breakout with McNeil and Pamphilon as the paddles. It was fairly even spread of the old and the new, which is in part what makes this show such a hit. Combined with the panel show element, it’s no wonder that it was popular enough at the Edinburgh Fringe to warrant a TV series. On a personal level, the best thing about this show is arguably the set. Filmed in front of a live audience, the round stage is surrounded by a wall of flashing blocks made to look like 8-bit graphics. The best part by far is when O’Briain announces ‘Let’s go 8 Bit!’ and the entire stage spins around so that the teams face a giant screen. I can’t begin to explain why, but this part is just incredibly satisfying to watch. Not to mention, seeing video games being played on such a huge scale is rather impressive whether you enjoy gaming or not. There truly is something for everyone in this show, which is why it deserves every success. It’s a perfect mix of the old and the new. Even if gaming isn’t your thing, the comedy side means the show is still appealing. If you are a fairly casual gamer, it is a great source of new and quirky games to try. Head straight to Dave and catch up on this underappreciated gem to discover all the joys that 8-bit graphics have to offer. 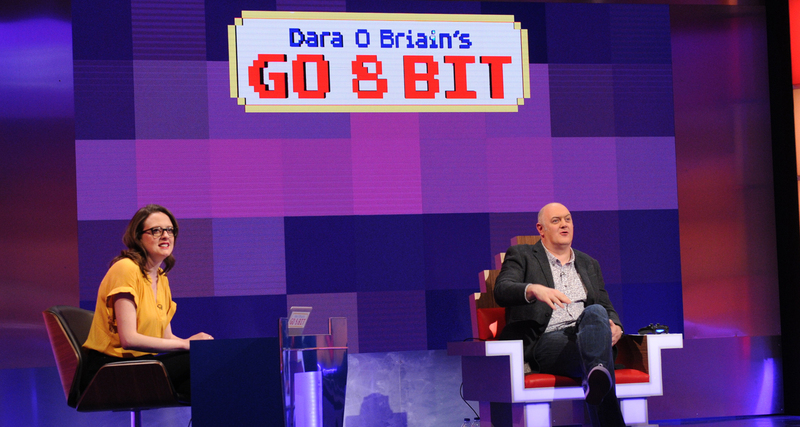 Go 8 Bit airs every Monday at 10pm on Dave. All past episodes are available to watch on UKTV Play.